I used green foam that I had left over from another craft, but you could use green construction paper too. I cut out a triangle tree, again because it was quick and easy, but you could cut out a tree with branches if you prefer. I then took tissue paper and cut it into 1 inch squares and crumpled them up. I gave the boys glue bottles and told them to put dots of glue all over their tree. When they were done they stuck the tissue paper to the tree. 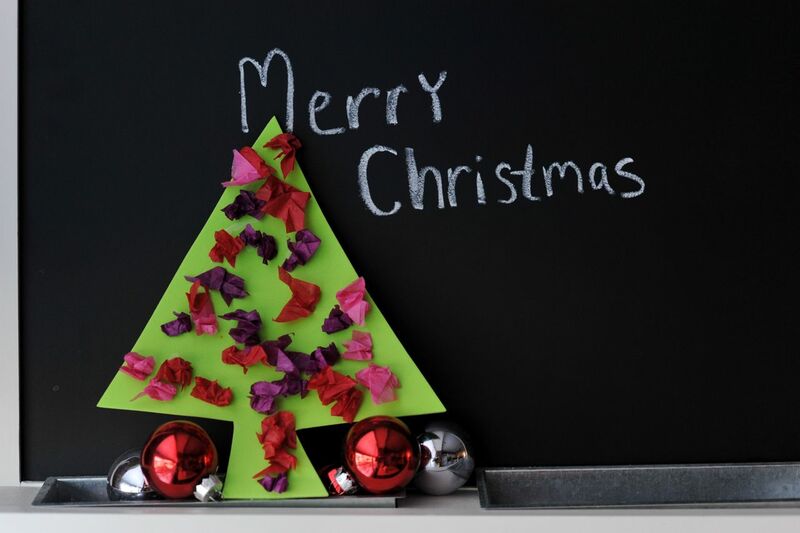 You can add a magnet and stick it to a chalk board, fridge, or anything magnetic. You could also punch a hole in the top of the tree and string a ribbon through it and make it an ornament. Another idea would to be to write a little message on the back of the tree and give it to a favorite teacher or family member. Who doesn’t love a homemade gift???? Have fun!